Monday, Aug 20, 1888 Warmer still, & one of pleasantest days for sometime. Ellery about usual duties, tho think hardly well as usual but had breakfast ready in good season, after which he picked peas for "dinner" & which we took at Mr Wedgwoods, as did supper also, as of late. Quite as well self, & at some few chores first A.M. as of late, with some knitting with rest P.M. when Estelle Pratt was in to sit awhile. Tuesday 21 Less warm, & quite breezey, but quite pleasant. Ellery some better guess, up in good season, & spending more of time in store having no help just now, being obliged to take less time for meals than usual. The last two of which we took with Mr & Mrs Wedgwood. 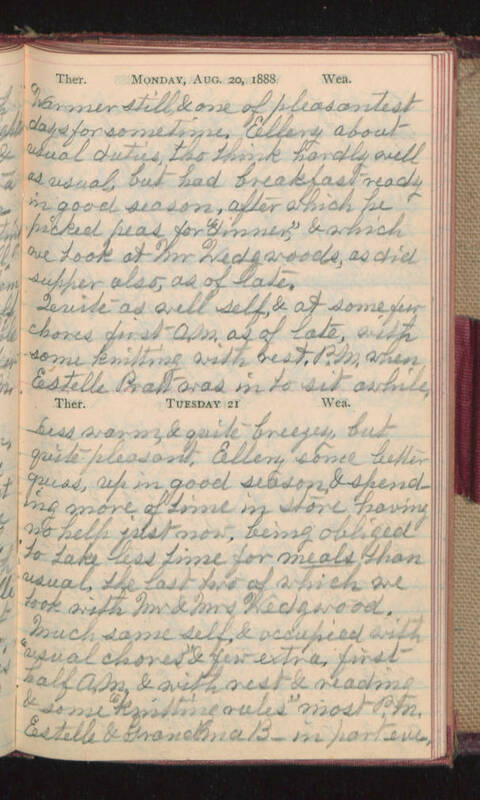 Much same self, & occupied with "usual chores" & few extra, first half A.M. & with rest & reading & some "knitting rules" most P.M. Estelle & Grandma B- in part eve.